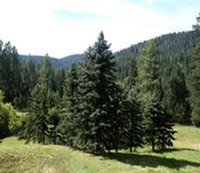 Enjoy the beauty, wildlife, fresh air and pristine night skies at 8100 ft. altitude in the midst of 1.1 million acres of the Lincoln National Forest in the Sacramento mountains of southern New Mexico. Study and quiet thought are encouraged by intentionally limiting distractions such as television and noise. A private two-bedroom guest house with separate kitchen and laundry facilities is available for families and small groups of up to six persons. We have a no pet policy for guests—more on that here.